As manufacturers of brake lines, hoses and fittings for some of the world’s leading automotive and motorcycle brands, Goodridge Ltd relies heavily on its hydraulic presses. When we first met the team at Goodridge, they were changing the hydraulic oil in these machines on an annual basis as part of their maintenance programme. However, they told us when they changed the oil, it didn’t always look like it needed to be changed. In response, we carried out oil analyses on the lubricant in their 28 hydraulic presses and discovered that different machines were using oil at different rates and therefore didn’t need to be changed on a set date. We recommended that they changed the oil only when it needed to be changed, saving the company money. In addition, we found several different makes of hydraulic oil in the various presses and suggested that as each oil was changed, Goodridge switched to just one brand of quality hydraulic oil throughout the factory. This product rationalisation ensures a consistent benchmark when carrying out future oil analysis. Finally, we recommended regular condition monitoring on the lubricant in Goodridge’s hydraulic presses. Analysis of the wear metals within the lubricant reveals any deteriorating internal machine components and helps pinpoint when maintenance needs to be scheduled to prevent a breakdown in service. 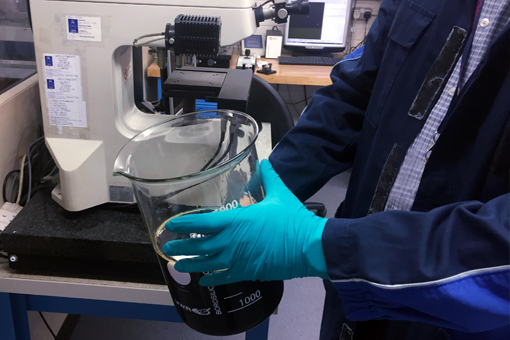 As a result of our analyses, Goodridge is saving money on hydraulic oil and reducing costly breakdowns by identifying potential machine component issues.